For those of you who have been immersed in the warmblood and sport horse culture of the last thirty years, I have a surprise for you: America has excellent sources of sport genetics in our native breeds. Huh? I know it is a shocker, but it is true nonetheless. During the research process for my first book I discovered America has had a sport horse breed continuously from the early 1600s, and that breed, the Running Horse, is the root source of our domestic breeds that succeed at sport today--that includes the American Thoroughbred, American Saddlebred, Standardbred, Morgan, Quarter Horse and our own domestic 'warmblood' which is the Hunter bred horse--a breed we have been selectively breeding in this country for three-hundred years. Not only that, America has been fielding an international sport horse since the mid-1800s. I must be kidding, right? How come you have never heard this before if it is true? It is because we did not understand the genetics of the modern sport horse, for if we did we would have remembered that we have breeding this same type of horse since Colonial times. And we were never told about our domestic sport horse heritage, a legacy that is as old as our country--America has always bred sport horses. I discovered this history through study of course, but also being a Tesio methods breeder I built up an extensive database of pedigrees and in so doing I was able to trace the origins of our domestic horses all the way back to the Colonial era. What I found both astonished and delighted me. One result of this education is that I have a newfound admiration for the genetic essence of our domestic breeds. I ascertained our original Running Horse breed arose from the same root source as that of the English Thoroughbred--at the same time. It was a small race-saddle horse which possessed prodigious amounts of speed and stamina along with natural gaits and a friendly disposition. This breed originates from the Hobby--an ancient Celtic breed, the purest strains being from Ireland. Bet you were never told that America had its own racing breed that was every bit as fast as the Thoroughbred--all one-hundred years before the first Thoroughbred got here--I know, you didn't hear about it and neither did I hear about it in all my years reading and listening about horses. Our Colonial Running Horse was a sport horse of the highest grade- able to run races at all distances from 1/4 to 4 miles--several times a day, at both the pace and the gallop--all one-hundred years before the Thoroughbred reached our shores. And it was an excellent saddle horse as well, tough and durable, friendly and comfortable, they were prized possessions of our forebears. The racing branch of the breed was first established in Virginia, and fifty years later in the Massachusetts Colony and New York; horse racing and the breeding of fine racehorse quickly spread to all the Colonies for both race, hunting and saddle use. 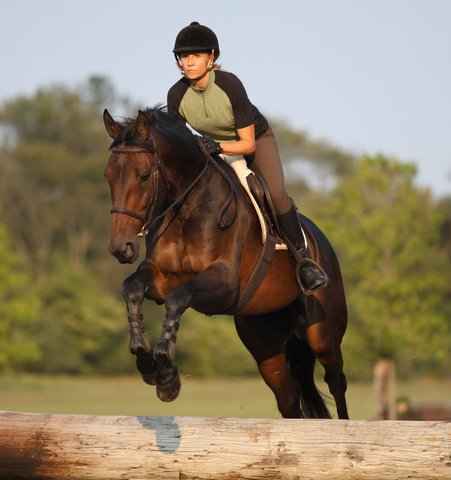 (A detailed accounting is provided in Standardbred Sport Horses). The breeders of these sport horses were the Plantation Owners, and they imported the best sport stock directly from Ireland and England. The horses were bred not just to race, but were also expected to be comfortable saddle horses and to hunt. The early colonies had a terrible problem with the native eastern wolf, so hunting on horseback was not just a sport but also a necessity. Hunting on horseback was a way of life--it was part of the culture, as was the breeding of fine hunters and racers, a culture imported from England and Ireland along with its horses. And scheduled hunts were an occasion for celebrating with feasts and dances as well. (Suspension and fluidness at the trot is a natural trait of Borealis who is a direct discendant of our first sport horse breed--photo courtesy of Julie Lynn Andrew). Our modern light horse breeds of Thoroughbred, Morgan, Standardbred, Saddlebred, Quarter Horse, Missouri Fox Trotter and Tennessee Walker all directly descend from this same source. A few years ago I would have had trouble swallowing this knowledge, for one thing I had no understanding about naturally gaited horses and how the fastest and most agile horses descend from them; but not now, for after years of research I am convinced that the best sport bloodlines in the world today come from these early sport horses both in the British Isles and on our continent. The equine historian and breed organizer John Wallace (1800s) and the more modern scholar Alexander MacKay-Smith have determined that speed both at the trot and the gallop originate from the pacing (gaited) bloodlines. The recent advances in genetics, such as Mitochondrial DNA studies, have confirmed what the scholar's research taught them--that speed and sport ability come from these horses. Just in the last few years continued mapping of the equine genome has surprised the researchers again by showing them that the sport base of the Thoroughbred was not Arabian horses, but what they call 'native' English and Irish mares, these mares we know from research were Irish Hobbies, Scottish Galloways and English Running Horse (Hobby) mares that were the base of the pre-Thoroughbred racehorse studs in England. These same breeds of horse were the base of the American Colonial racehorse also. And this Colonial racehorse became the base of our domestic race, saddle and sport horse breeds. Further, the sporting breeders of our colonies specifically selected for speed, stamina, soundness, correct gaits, courage and good disposition--thereby solidifying the most cherished characteristics of the original Hobby. Because many of our American breeds have common ancestors in those early sport horses they also now have a natural genetic affinity for each other in proven sport genes. Later on certain populations of these racers were bred to excel at heat-racing, and by the early 1800s our native breed had exceeded all previous distance records. The level of speed, stamina and soundness required for their performance ability demonstrates they carry the finest sport genetics ever developed in any breed of horse. Those extreme genetics are sitting right there in the background of all our domestic sport breeds, and it presents an enormous opportunity for the enlightened line-breeder. How can a horse from the 1800s effect the performance of our horses today? By carefully creating a 'critical mass' in those superior genetics you will begin to see the type of those long ago super stars present itself in your foals. Dr. Bowling taught that normally genes do not change, that they travel down through the generation unaltered, and clump together in clusters. When we build up the background lines in superior stock, there is a point where the genetic balances tips to the components of those stars of yesteryear. This means by selective breeding we can re-activate and concentrate the best genes for our goals: Tesio Methods. This information on the superb genetic base of our native horse breeds is far too important for us as breeders to not explore and exploit. Therefore, it is now my goal to change all that, to help us discover the hidden gold in our domestic sources and to demonstrate how to unlock that potential. This will require identifying the key bloodlines that are potent sources of the sport talent which will give us the sport success we have been searching for. To that end I will present modern examples of domestic sport horse talent. Naturally our American Thoroughbred carries background ancestors that we want to identify and exploit. You will find those bloodlines explained in detail with the modern concentrated carriers of those lines identified in Legacy of Lexington. Our Standardbred is a unique breed, and it carries the best sporting elements of all our other sport breeds--and it can be a key component of our future success. 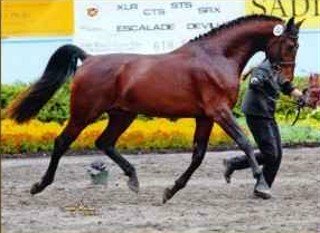 Read about those bloodlines in detail in Standardbred Sport Horses. The Morgan and the Saddle Horse bloodlines that excel in sport are all covered in there as well. On this site is a brief outline of our domestic breed development and origin for your immediate information.